B's Beauty and Books: June Unboxing: Sephora Play! 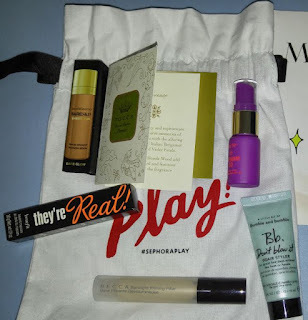 This month's Sephora Play box was all about The Minimalists! This month's box had some awesome hits! And for $10 a month to try out expensive products is totally worth it! Description: Air-dried hair is having a moment. The not-so-great thing about an air style is texture can be unpredictable and flyaways have a mind of their own. This innovative hair cream creates a more refined take on this relaxed style for great hair days—without the heat or hassle. A texture-enhancing blend of lightweight polymers boosts hair’s natural texture and adds bounce while a plant-based conditioning blend keeps hair soft and hydrated. I have fine hair so this is actually something I will be trying this month. Not usually very big on hair products, but this one I will give a go. Description: This breakthrough bestseller reveals lashes you never knew you had! The specially designed brush features staggered bristles that grab close to the root, boosting length and volume beyond belief. The custom-domed tip uses precision bristles to lift, define, and curl even your tiniest lashes. With a glossy, jet-black, long-wearing formula, you’ll flaunt luxurious, silky lashes that won’t smudge, clump, or dry out. I love Benefit so much! This was just another added bonus to this month's box. They have some of the best eye products in the business! Description: Protect skin from harmful rays—even on-the-go—with tarte’s first multi-tasking, antioxidant-infused daily sunscreen. The lightweight, non-sticky liquid lotion contains all-mineral, non-chemical and broad spectrum SPF 30 ingredients that help protect against the sun’s damaging UVA/UVB rays that can cause dryness, redness, dark spots, fine lines, and wrinkles. Recommended by The Skin Cancer Foundation for daily use, the skinvigorating™ formula is also infused with maracuja, red algae, soybean, apple, and honeysuckle extracts to nourish, tone, and retain moisture while helping to combat signs of aging for a firmer, brighter, smoother appearance. The fresh, ocean’s lily scent allows for luxurious, spa-like daily applications, while the high-performance liquid emulsion seamlessly melts into skin, leaving it supremely soft and silky. I love Tarte, that being said, straight SPF formulas tend to run greasy on me. I will try it, but not holding out much hope. Description: With a unique, innovative bronzing formula, bareSkin® Sheer Sun™ Serum Bronzer’s silky, sheer tint of liquid spotlights your skin with a warm glow. The ultra-thin, lightweight formula blends beautifully, adding a sunkissed veil to a universal range of skintones. Contour and define to flatter your best features, or layer it on top of your favorite foundation to give your skin natural-looking, bronzed radiance all year long. Description: Backlight Priming Filter creates a canvas for your makeup, extending its wear from day to night. Infused with three unique Filtering Luminescent Pearls, each one adds a different drop of diffused light. Blended together, they impart a one-of-a-kind, lightweight, whipped fluid that creates a smooth canvas and acts as an instant filter, while the vitamin E-enriched formula minimizes the appearance of fine lines and wrinkles. I have used this and I love it. Just not on me. It works better on skin that is not oily, because it makes you look more oily. Description: A Parisian beauty and sophisticate, Florence conjures memories of old-world Paris. It is an alluring combination of Italian bergamot and crushed violet petals. Ivory gardenia combined with blonde wood evokes a sophisticated and feminine scent that conjures the elegance of a Parisian sophisticate. I LOVE LOVE LOVE this fragrance! 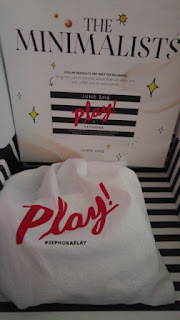 Every month Sephora Play sends out a fragrance and this month's rocks! I will be making this purchase for sure!!! This month, like last month, you get a cute little draw string bag that everything comes in. I just can't stress how cute this all this.